One of my own favorite parts of Firefox, besides the fact that it actually works correctly all the time, is that the text can be easily enlarged for people whose eyesight needs that feature. Yes I know others are starting to add that feature, but not all, and not as easily. It's also just SO much better than the continual crashes from IE. It makes computing fun again! btw, when can we see a post on Java QuickStarter ;) ? Firefox 3.5 rocks. It's really quick. 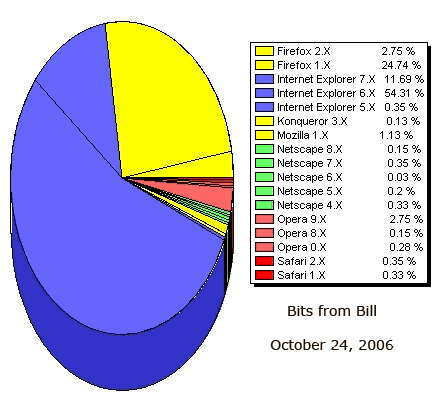 I'm assuming these are stats from your site Bill, where you will find much more security conscious users who tend to like FireFox and Safari more than the general populace. 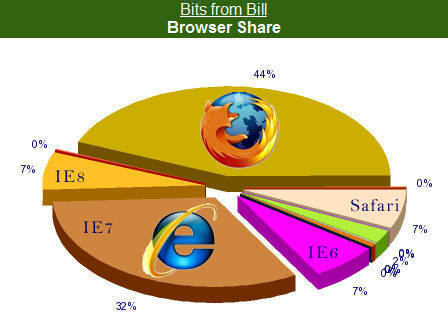 I think you'll find that the average Joe User out there will still have a 15-20%-ish chance of being a FireFox user. Since so many people are now using Firefox, it's a pity that Pitstop doesn't get its act together and allow users to use Firefox to run tests. Echo that. When is PCPitstop going to get its act together and launch a Firefox-compatible suite of tests? My sentiments exactly. I'm one of the unfortunate ones who's lately been trying to run the online PC Pitstop tests using IE and it crashes every time it gets to where it's analysing the results. I absolutely love the download helper. I have not used frostwire, limewire or any type of peer to peer download program since I discovered it. It's the greatest. I love being warned about potential bad add ons too. I hate IE 7 and 8 and sites are now warning you about your out dated browser if you are still sticking to IE 6. It's just better than 7 and 8, one of Microsoft better bad ideas, trying hard to mimic Firefox and failing. Yes, I wish other sites would be Firefox friendly. I use American Greetings cards online all the time. The web program has to shell out to IE and then....50% of the time it crashes! Can't wait until it is a Firefox wold. FireFox is crap, I use Opera. I find Google Chrome fast and a small footprint/overheads..
Any other users out there? What's the thing that makes other browsers different/better? IE go home, firefox is the future!